Thursday June 30th 1881 Hatt came over quite early this morning and stayed till after dinner when I went home with her to put up berries. We got them nicely done before supper time. I walked home after supper and practiced in the evening. 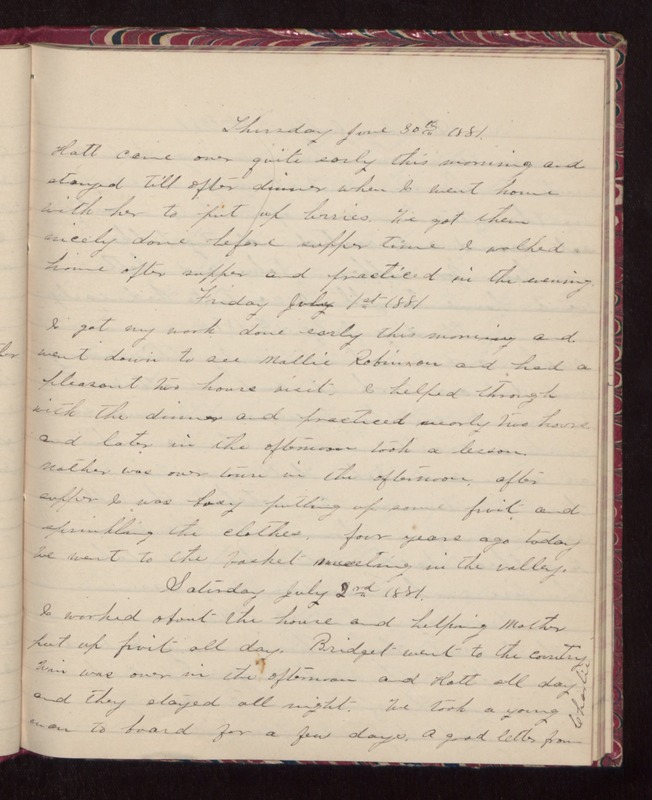 Friday July 1st 1881 I got my work done early this morning and went down to see Mollie Robinson and had a pleasant two hours visit. I helped through with the dinner and practiced nearly two hours and later in the afternoon took a lesson. Mother was over town in the afternoon. After supper I was busy putting up some fruit and sprinkling the clothes. Four years ago today we went to the basket meeting in the valley. Saturday July 2nd 1881. I worked about the house and helping Mother put up fruit all day. Bridget went to the country. Win was over in the afternoon and Hatt all day and they stayed all night. We took a young man to board for a few days. A good letter from Charlie.